We continue to process and prepare donated items for display while we are open for visitors. The Kentucky Renaissance Pharmacy Museum continues to be visited by numerous individuals who share their eagerness to visit other exhibit areas as they open for viewing. Our new museum is a major attraction, a very public and unique showcase for our profession and the leading preservation organization for pharmacy in our state. A preservation standard for the Kentucky Renaissance Pharmacy Museum is that each item displayed will be inventoried, photographed, measured and evaluated for our records. All of the donations in the first room have been processed as such and we are completing this process for each item throughout the museum. This process supports the coverage provisions of our insurance carrier but is also essential to assure the continuing legacy of the donated item. 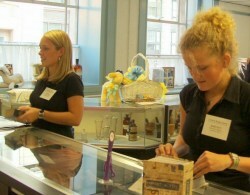 As a non-profit 501(3)(c) museum, we depend upon volunteers for our work force. In addition to serving as docents, the following are examples of how volunteers have helped us preserve the history of Kentucky pharmacy. * Members of the Lambda Kappa Sigma Alumni helped with painting and site preparation which allowed us to host a reception at the KPHA in June 2005. * Friends have helped with the staging of the numerous receptions. * Architects and archivists have volunteered their professional services in the development and remodeling of the museum. * JCAP Pharmacists packed up, delivered and unloaded the Hinton Collection from Louisville’s Newkirk’s Pharmacy. With the help of all pharmacists and others who support our profession, we can move forward in completing our initial implementation plan. If you want to be a part of the preservation of the Kentucky pharmacy history, there are several ways you may express your support. Docent Volunteers - Docents have volunteered numerous hours and continue to be needed for the hours when the Kentucky Renaissance Pharmacy Museum is open. Our usual hours are Saturdays and Sundays from 12 noon to 4 PM. As additional docent staff is available, the museum will open Monday and Fridays from 12 noon to 4 PM as are the other museums in the Lexington History Center. 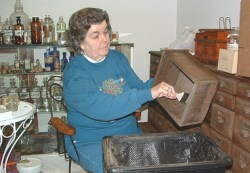 Training and support is provided for the Kentucky Renaissance Pharmacy Museum Docents. Curator support - Friends and colleagues have set up and organized the showcases. We are grateful to friends of the museum with conservancy experience who have graciously donated their time and expertise in the preservation and presentation of the donated items to date. Friends and Pharmacists have helped clean, organize and prepare some of the displays as well as some of the donated items. Financial contributions support our wide range of efforts mentioned above in the preservation of the rich history of the Kentucky pharmacy.